Ozone therapy can be used for a range of dental applications, and we incorporate this advanced technology at South Ogden Smiles to enhance many treatments for the benefit our patients' oral health. Using a high-tech machine that creates ozone particles, Dr. Patrick Tanner can harden enamel, eradicate disease-causing bacteria, and sterilize our water, among other uses. 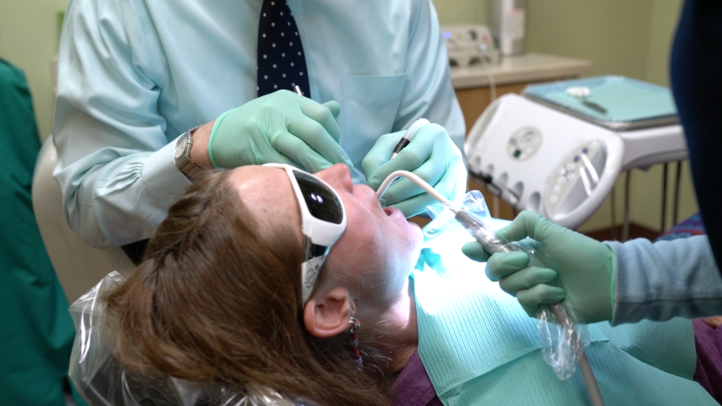 Ozone is a safe particle that can be incorporated into a gas, liquid, or ointment, and we are proud to be one of only three dentistry offices in the state to offer this revolutionary treatment. To learn more about how your oral health and smile can benefit from ozone therapy, contact our South Ogden office and schedule an appointment today. Ozone is used to treat patients in a variety of ways, including the ability to disinfect water lines without the use of chemicals. Ozone leads to residue, and is a great advancement in the medical field that allows us to keep water lines pure, safe, and sanitized. We can also use Ozone at our South Ogden, Utah, practice while removing cavities to stimulate new growth and promote optimal health. When an oxygen molecule binds with a third oxygen atom, an ozone molecule is produced. The addition of an oxygen atom creates a negatively charged molecule that wants to bond with positively charged molecules. Many of the dangerous, disease-causing cells that exist within our mouths and throughout our bodies have a negative charge. Because ozone is drawn to these cells, it can effectively perforate their exteriors and destroy them. At South Ogden Smiles, we harness the benefits of this process to help rid your body of substances like decay, periodontal disease, and more. Our specialized ozone machine uses oxygen to create liquid ozone, or ozonated water, and a gas. Ozonated water is much cleaner than distilled water, and can kill bacteria, fungus, and any other negative substances on our instruments, machines, and within the water that is used during treatment. The gas form may be used during root canal therapy or sinus treatment to kill bacteria in hard-to-reach places. Ozone molecules harden the surface of enamel, and perform the same function as fluoride treatments by strengthening the teeth. It is a great alternative for patients who do not want fluoride treatments for themselves or their children. For patients who suffer from decay and cavities, ozone can penetrate hard-to-reach places between the teeth to eradicate bacteria. This therapy can be used alone or as a treatment before a filling is placed. In much the same way it removes decay from within cavities, ozone molecules can penetrate pockets of infection to combat gum disease. Both liquid and gas-form ozone are effective at restoring periodontal health, and often are often used in conjunction with laser gum therapy. Eliminate Sensitivity - Because ozone hardens enamel, it can reduce sensitivity patients may feel during certain treatments. By filling a treatment area with ozone gas, patients may require little or even no local anesthesia. Sealants applied to the tops of teeth can help prevent bacteria from building up within deep grooves. By using ozone therapy before a sealant is applied, we can ensure we are treating a clean, sterile surface. Regardless of whether you are in need of restoration or a simple cleaning, ozone therapy can enhance your quality of care for a healthy, beautiful smile. To learn more about ozone therapy and what it can do for your oral health, contact our office today and schedule an appointment.